The Fairhaven Estate Railway which was a light railway used to develop Fairhaven, between Lytham & St.Annes. Thomas Riley constructed a railway at Fairhaven to bring in building materials and to move 1,000s of tons of sand and shingle. This was not a passenger line. This light railway came off the main line at Ansdell Road and bifurcated at the Double Stanner. It ran along Outer & Inner Promenade (i.e. around Fairhaven Lake) and continued to Cartmell Road, St.Annes. The Fairhaven Estate Railway c1892, looking towards St.Annes. 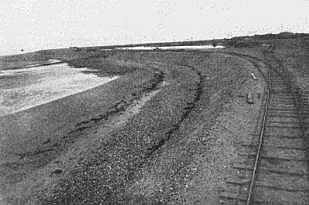 The railway is seen here running along both banks of shingle known as the Double Stanner. This is now the Lytham end of Fairhaven Lake & Inner Promenade. 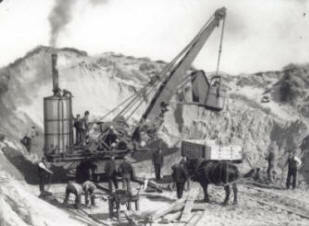 An "American Devil" levelling a sand dune, loading the sand onto a railway wagon, 1892. Two engines are known to have operated on this light railway; "Preston" and Fairhaven". The railway was removed about 1916.